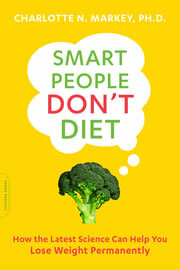 I’m currently reading Smart People Don’t Diet by Charlotte Markey. The book offers a “science-based approach” to weight management backed by academic research from scientists, doctors, nutritionists, and psychologists. Sounded good to me. The main takeaway from the book so far is exactly what the title says: Diets don’t work. Why? You can’t achieve permanent weight loss with a temporary plan. A diet is almost always a short-term gimmick, like “no carbs” or “eat only this smoothie for lunch” or buying meals from Nutrisystem. Once you go back to your original eating habits, you’ll go back to your original weight. Therefore, any changes you make should be something you can maintain for the rest of your life. Can you really not eat bread ever again? Or eat processed frozen meals forever? For a few people yes, for most people no. Looking at everything through the long-term “rest of your life” filter encourages you to consider carefully and find changes that are sustainable. Skip the ideas that are unreasonable (for you). These days, there is no way I am waking up early to work out every day. I will probably never be a vegan or even vegetarian. However, I can exercise twice a week in the evenings and reduce my portion sizes. It feels natural to compare weight management and money management. For weight loss, you are consuming and burning calories. For personal finance, you are earning and spending money. In terms of consuming less calories, this meant consciously choosing food that truly give me joy, and cutting back significantly on the rest. I love cheese, crusty bread, and roasted vegetables. I discovered that I could reduce the following to once a week or less without significant pain: beer, desserts, and red meat. Research supports the idea that for weight loss, eating less is far more important than exercising more. In terms of managing my spending, I tried to identify the things that truly give me joy, and cutting back significantly on the rest. I plan to always spend a big chunk of money on travel every year. On the cutting room floor: I spend very little on clothing and entertainment, I never go to bars or clubs, and I dine out at restaurants less than once a week. Here, your savings rate is most critical, which places high importance on your income levels as well. One-time actions can also be sustainable as you don’t have to use up your willpower over and over, such as moving into a smaller house (lowering housing, maintenance, insurance, and utility costs all at once). In terms of eating, simply never allowing certain tempting foods to enter your home will help you avoid eating them (salty, crunchy things like potato chips are my weakness). Can I keep all of this up forever? I don’t know, some stuff I’ve already kept up for years, and others have only lasted the last 6 months or so. I suppose you could argue that if you manage to accumulate a big enough pile of money, you could never have to work again. But even that assumes a certain level of long-term discipline, as many people with many millions of dollars still manage to go broke all the time. Which reminds me… taking the long-term view also means you need to expect failures, both financially or weight-related. The important thing is to accept that you stumbled, pick yourself up, and keep moving forward. You’ve got the rest of your life to go, right? Can you really not eat bread again? A better question would be: Can you stop eating bread (or carbs) every day? And the answer is of course you can. I switched to paleo four years ago, and it’s just become a way of life—not a diet—and the 10 kg I dropped never returned. But weight loss is the least of the benefits. 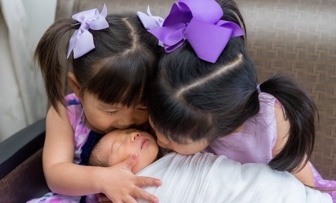 The amazing blood work tells a more important story. I’d strongly recommend reading Taubes’ “Why we get fat”. Congratulations on your weight loss and improved health. Yes, anyone could completely stop eating carbs and bread, but I seriously doubt most people will. Will the Paleo diet trend – and it is a relatively new trend – survive and be just as popular 10, 20 years from now? I don’t know, but this book suggests that it won’t. I personally don’t see the need to remove all carbs from my diet, just as I don’t see the need to remove all meat. I’ve reduced both and it has helped. I see a strong correlation between exercising, dieting and saving money. It is the same principal of being consistent and sticking to a long-term plan. I like to call willpower a muscle. You can build it up, but if you keep using it the muscle will still get tired. One thing that helped me was to learn about the cruelty and environmental waste behind unhealthy meat. Many people think abstaining from a steak is about will power because, of course, everyone loves eating steak. But for many people, after seeing and reading about the horrific abuses that are required to produce a steak – it loses it’s appeal. It actually becomes pretty repulsive. That happened to me reading Peter Singer’s work on ethical attitudes toward animals – and he describes the basic functions of industrial agriculture as reported in trade magazines, not just the worst of the worst – and it was more than enough cruelty to make me ditch unhealthy meat. I support the various reasons behind plant-based diets, including the ethical and the environmental reasons. I’ve cut my meat intake significantly, probably by over 50%. But right now I can’t see myself going 100% meat-free for the rest of my life, so I think this path for me is better than going vegan for 2 weeks and then giving up competely. Moderation isn’t as trendy as elimination, but it works for me. It sounds just like a confirmation of the observation made a long time ago: wealthy people will get wealthier, overweight people will get more overweight etc. just because something made (and will likely continue to make) them wealthy/overweight etc. However- and the testimony to that is your blog- this vicious (or virtuous) cycle can be broken. It takes changing the one’s mindset about certain things- it maybe a small one (giving up a dinner roll at dinner for life. period), or a really big one. @theofficialjohnandre, like Jonathan, I’ve found that when I’m saving money I’m actually eating less healthy. I cook at home, usually making a big box of pasta (with veggies and some protein), and eat to my hearts’ content to avoid feeling deprived. If I go out to dinner, I eat a regular size portion, usually very healthy, like salmon and asparagus. When I have more money at my disposal, I usually go out and do more things (by myself or with my kids), and also distract myself from eating. When I’m home, the refrigerator unfortunately becomes a source of entertainment! Yeah, there are free things to do, like walking the dog or riding a bike, but I find I usually need $20-30 to do anything somewhat fun. So, actually, I believe my diet and my budget are inversely related. I find that if I buy it, I will eat it. So I TRY real hard not to buy anything bad, because my will power is horrible. My girlfriend loves to cook, so we will often stock up on Salmon and Chicken at Walmart and pre-select our meals for the week . Usually I will pick a cheat night (Friday’s) and go out to eat. It is an interesting combination. I have the discipline to save but food more of a luxury item that I try to find the time to eat well when I am not focused on other more important aspects of life. I think you need to make saving and eating well a priority but it will take major life changes to do both if you struggle in one or both areas. If you have both under control your life will be in high definition. Some interesting thoughts. I think I’ll have to pick up this book. I do know it’s easier too to slowly change your eating and work out habits rather than quickly switching to a diet or work out plan. Love this comparison. Great post. Thank you for sharing that.